At dinner last night, my seven year old asked me for a glass of wine. I panicked. Just last week she asked me for a cup of coffee. Should I be worried? Are these signs of her addictive future foreshadowed before me?! I’ve read different perspectives about children and alcohol. One is let them taste it early, let them learn that they don’t actually enjoy the flavor (but not enough to get them tipsy). Another is to tell them no how, no way, never! 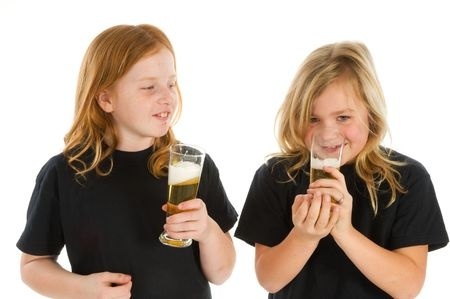 A new report from the American Academy of Pediatrics attempting to prevent binge drinking in young people, suggests that parents should start talking to their children about drugs and alcohol at age 10. Huh? How do I tell that to a nine year old? Honey, it tastes like dirt, but makes you feel really good so make sure you stop drinking at 2 glasses or you will do stupid things you might get teased about the next day. Seriously though, what does one say to a nine year old – what do they mean, talk about it? That seems so young to me. 9 is still the age of innocence in my book and I was still playing with dolls. Wasn’t I!? But the Internet has given our children access to a view of the world, at the fingertips, that you and I didn’t have. Both positive and negative. Don’t get me wrong, we still had access, but we had to work a little harder for it. When was your first drink? I don’t remember mine. I do remember the first time I got drunk, and it wasn’t anywhere close to nine. Have times changed that much that children are getting drunk at 10? If so, that saddens me. I realize that kids are curious so, I am not waiting to have that “talk” with my daughter. When she asked me why she can’t have a glass, I explained to her that alcohol isn’t good for her liver if she takes more than a few sips, and that it might make her feel dizzy or throw up if she drank an entire glass. I also explained to her how coffee will give her a tummy ache/cramps or even diarrhea. And I believe both of these answers, even if they are dramatized for effect. As long as you keep the conversation age-appropriate, you should be successful in educating your children about the adverse affects of drugs and alcohol, without freaking them out too much. But don’t go overboard, with your war stories, to where you intrigue them and cause them to want to try it out of curiosity. Reading these studies has alerted me to one thing that I already knew- Make sure I know where my children are all the time, and what they’re doing. Basically, communicate with them and be involved!